What do you buy your father for his birthday when you know that you can’t afford the Ferrari Dino 246 that he wants? My children decided on a pair of socks. As a dutiful parent, I gushed that I’d always lusted after a pair of these, but hadn’t been able to afford them. When I wore them, they proved to be comfortable, and kept my feet dry. I took to wearing them on my longer runs, and they didn’t let me down. However, prior to a 15 km run following a series of longer runs they were lost in the sock drawer so I pulled on a pair of conventional socks, and proceeded to get blisters for the first time in the training campaign. So, I’m a convert. Ah … the joy, luxury and promise of a new pair of running socks! Although never troubled by blisters, pre race nerves often steer me towards the technical sock section of running expos. The expensive ones do wash ‘n’ wear extremely well but I’m yet to find a pair which prevents the unsightly post marathon black toe nail phenomenon. 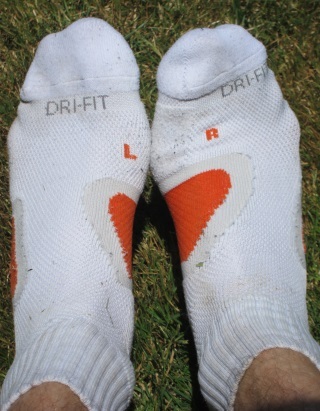 Do you think right & left socks make a difference?